I have a confession. Up until last week, I didn’t have any music on my phone. I never bothered to learn how to put it on, and besides, I’m always nearly at maximum capacity due to the amount of photos I take. I used to love listening to music, but since I’ve been a mum, that’s all gone out of the window. 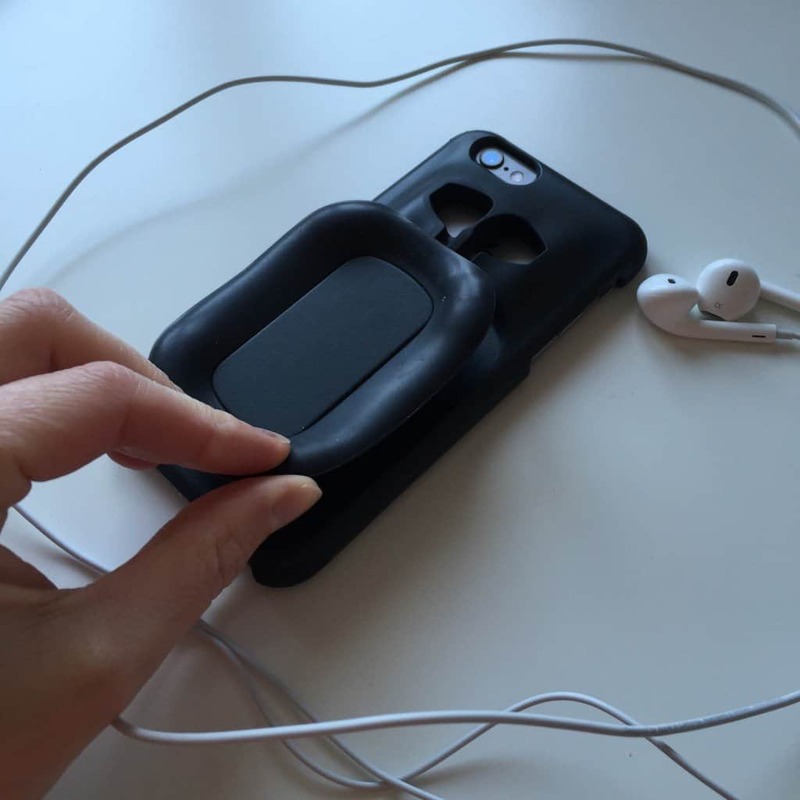 But that has all changed, thanks to a nifty new phone case I was sent to review by Dome8: it’s an iPhone Case that holds headphones*. 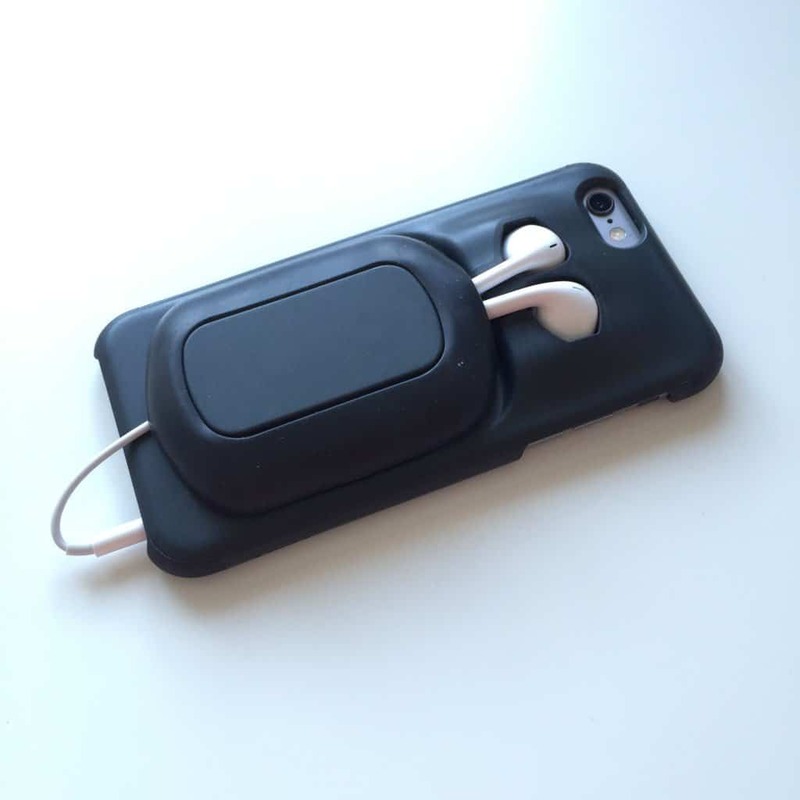 The Dome8 case has a ‘dome’ to wind the headphones around, before flipping down a protective flexible cover, and special holes in the back that fit your earbuds perfectly. 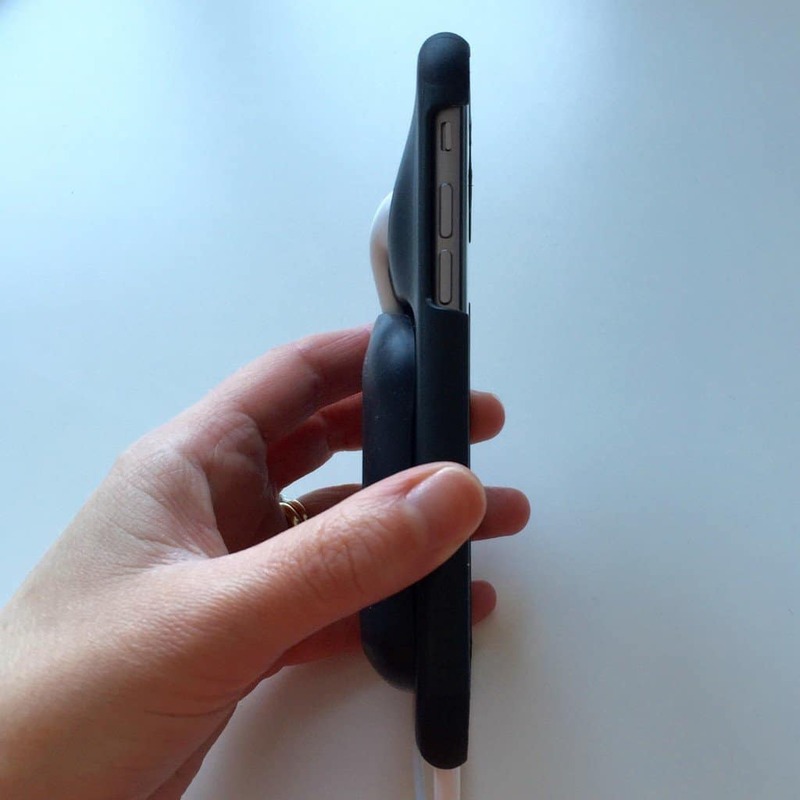 …flip back the flexible lip and slot the ear buds into their little holes. It means your headphones are kept tangle-free and (importantly for parents with bags full of kids’ snacks) crumb-free. It comes in several different colours, and I got plain black, and it costs £14.95 with free delivery. There is a version for the iPhone 5/5s, and I got the 6/6s version. 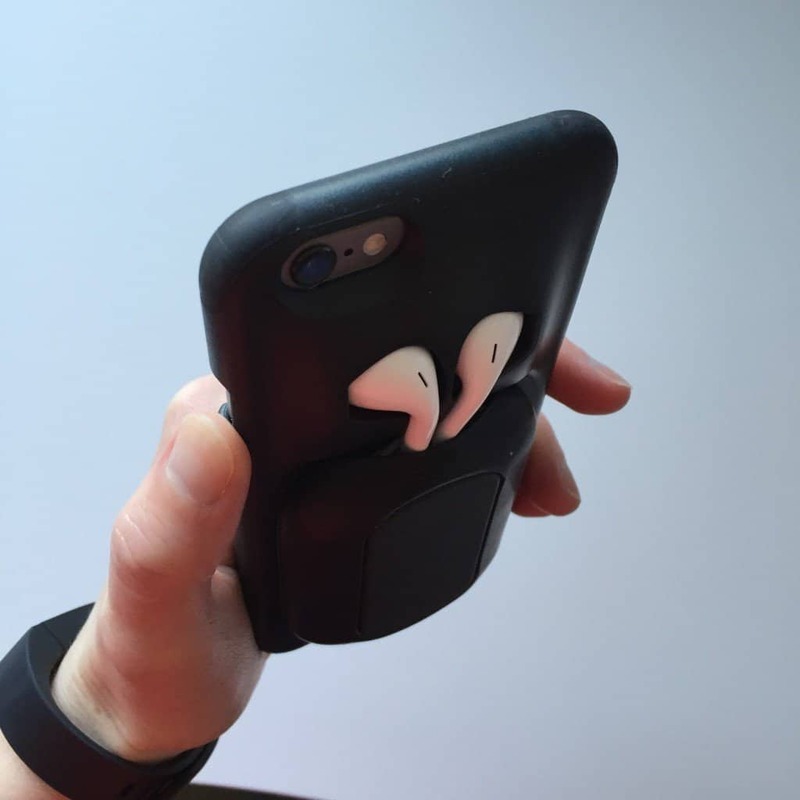 The case is nice and lightweight but at the same time it feels like it would protect your phone if you dropped it (again, a plus point for parents!) as it has shock absorbers built in. Of course all of the buttons and charging ports are easily accessible and it’s easy to put on. The edge is raised slightly, which means it helps protect your screen, and because it has the ‘dome’ on the back, I found it makes my phone more comfortable to hold. 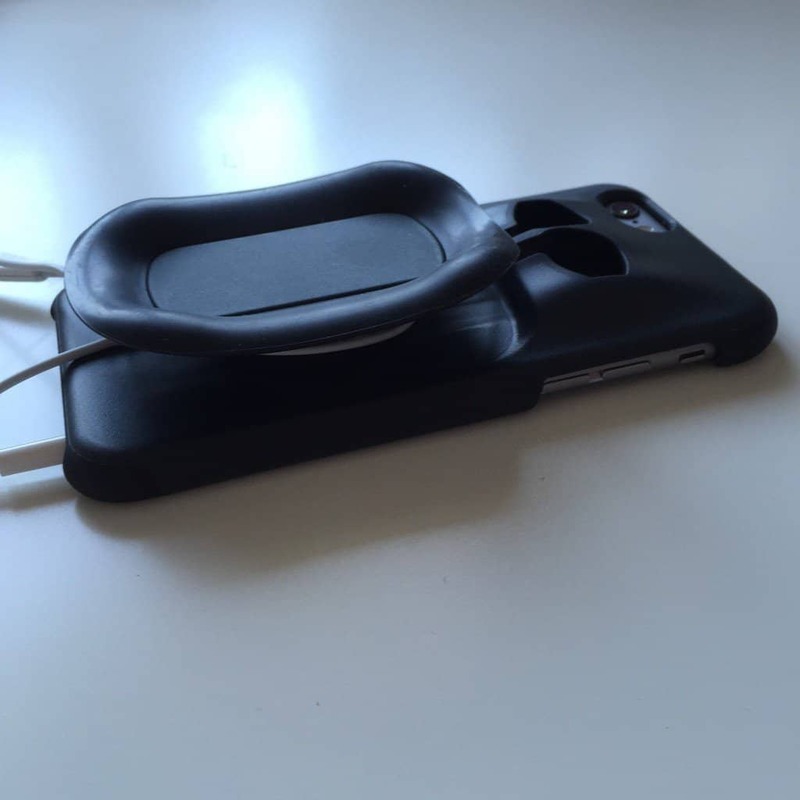 It also holds it a little higher off the table, meaning if your kids are prone to spilling drinks, you might be able to save your phone! I gave the Dome8 to Ryan to try out as he is always using his headphones. He liked it, but found the dome made the phone a bit too wide to fit comfortably in his pocket along with his wallet – you can see it more than doubles the depth of the phone. So we swapped it over to my phone and I am getting on really well with it, and it fits fine in my back pocket, which is where I normal keep it when I’m in the house. It wasn’t the easiest thing to swap the case from phone to phone, as it fits so snugly, but you would normally just put it on once so I don’t think that is a problem. I like the way my headphones are now attached to my phone, waiting for me, not left behind or tangled at the bottom of my bag. And they aren’t just dangling about, getting in the way of the screen. I now have a smart, protective case, and protected headphones, so I can actually listen to music – I’ve been using it on my way home from dropping the girls off at school and nursery on the days I’m working from home, and actually manage to get ready in time to walk! *Please note I was sent this case for the purposes of this review, but all opinions, as always, are my own. I got a Spotify app on my phone so you can listen to music via the Internet without taking up any memory on your phone. I use it at work where they have wifi.